Up to 50 different "Apple Tablet" type devices were "detected" by Flurry Analytics testing various types of apps that may make its way to the upcoming machine. Flurry was able to geographically locate the devices to Apple's headquarters in Cupertino. In short, there were about 200 different apps being tested on the devices, most of which were games, media or some type of entertainment-type program. It more or less mirrors the type of applications we've been seeing in the app store for the iPhone. In addition, the devices were running OS 3.2, which means either that the Tablet is running an iPhone-like OS, or that this is a bigger iPhone/iPod Touch type deal, and not exactly like the tablet we've been picturing. In any case, if earlier rumors were true, developers are already building apps for it. Flurry didn't give any other details about resolution, memory or anything else they determined from their analytics tracking. Using Flurry Analytics, the company identified approximately 50 devices that match the characteristics of Apple's rumored tablet device. Because Flurry could reliably "place" these devices geographically on Apple's Cupertino campus, we have a fair level of confidence that we are observing a group of pre-release tablets in testing. Testing of this device increased dramatically in January, with observed signs of life as early as October of last year. Apple appears to be going through its cycle of testing and polish, which is expected from any hardware or software company as it nears launch. Apple is expected to announce the yet-to-be named hardware on Wednesday, January 27 in San Francisco. There has been broad speculation about the functionality of the tablet, and what kinds of content and media partners the new device will feature. Additionally, there has been speculation about the most likely use cases for this kind of device, as well as which operating system the device will support. The choice of operating systems is particularly important for application developers because if the tablet runs on the same or upgraded operating system as the iPhone, then current applications running on the iPhone will also run on the tablet. On these devices, Flurry observed approximately 200 different applications in use by testers. Studying category trends provides insight into the kind of user Apple is targeting and how it expects the device to be used. 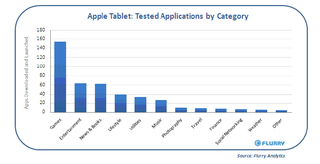 Below is a chart that shows the number of applications in use by category across test devices. Historically, tablet devices have been considered substitutes for anything where workers use clipboards, note pads or day runners. In more industrial settings, they could be used for inventory management, taking purchase orders or data entry. However, there was a surprising dearth of applications that support these use cases. Instead, the largest category was games. With a larger screen, more memory, multi-touch and multi-tasking expected, games will play better than ever on Apple handheld devices. The tablet device clearly targets consumers. The mix of applications observed comprises mainly of media and entertainment consumption as opposed to enterprise, productivity and computing. Specifically, popular tested apps include news, games, entertainment and lifestyle. In particular, there was a strong trend toward news, books and other kinds of daily media consumption, including streaming music and radio. In fact, the most widely downloaded of any single specific application was a new app. In its October Pulse report, Flurry studied iPhone as an e-reader and the threat this poses to Amazon Kindle. With rumors of large newspaper and book publisher deals, combined with its reading-friendly form factor, we speculate that the new Apple tablet will focus heavily on daily media consumption. Finally, across all applications detected, there was a strong theme of sharing and/or social interaction including social games, social networking, photo sharing and utilities like file transfer applications. The device is positioned to appeal to the users who are out-and-about rather than compete directly against the TV, stereo and game console in the living room. With supply chain reports from Asia that light-weight 10.1" LCD and OLED screen components are in short supply due to large purchases presumably by Apple, we can surmise that the device will be thin and light, designed for portability. Further supporting this notion is the pattern of apps we detect for restaurant, movie show times and other apps that help users find points of interest around them, including travel guide applications. A noteworthy observation is that the Apple hardware we detected was running on OS 3.2, which has not yet been released. Currently the iPhone and iPod Touch are running on OS 3.1.2. Historically, Apple releases OS upgrades just before releasing new hardware. With significant expected changes (e.g., multi-touch, multi-tasking) for the tablet device operating system, there was concern among application developers that the tablet would not support existing iPhone applications. However, from the testing we observed, it appears that Apple wants to leverage the 130,000+ applications already available in the App Store on day one for the new device. For the developer, this is good news. Senior research analyst with Piper Jaffray, Gene Munster, is forecasting 2010 sales of iPhone and iPod Touch devices at 36 million, an increase over his estimate of 25.7 million for 2009. With tablet shipments for 2010 perhaps reaching 10M, according to AVI Securities, we see this as a major boost to application developers.